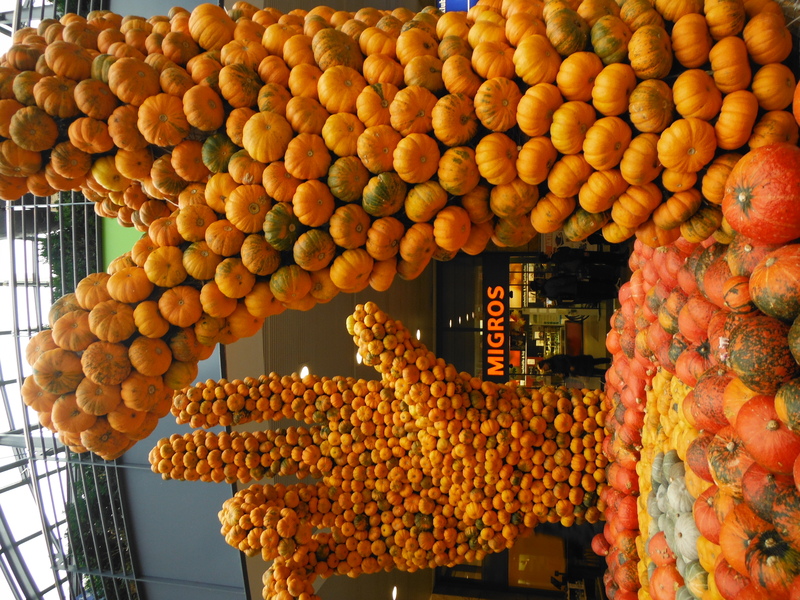 Pumpkin love knows no bounds in Switzerland. 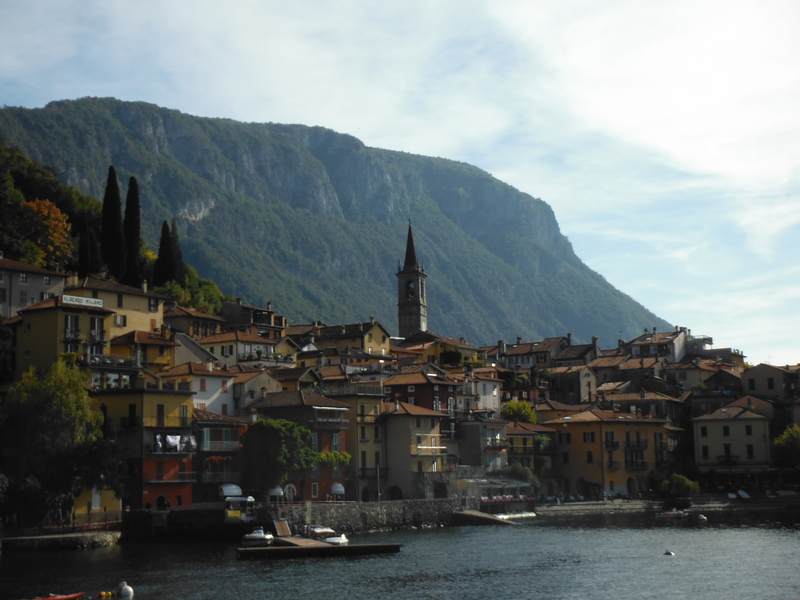 Most of the pictures below are from a shopping centre in Zug. 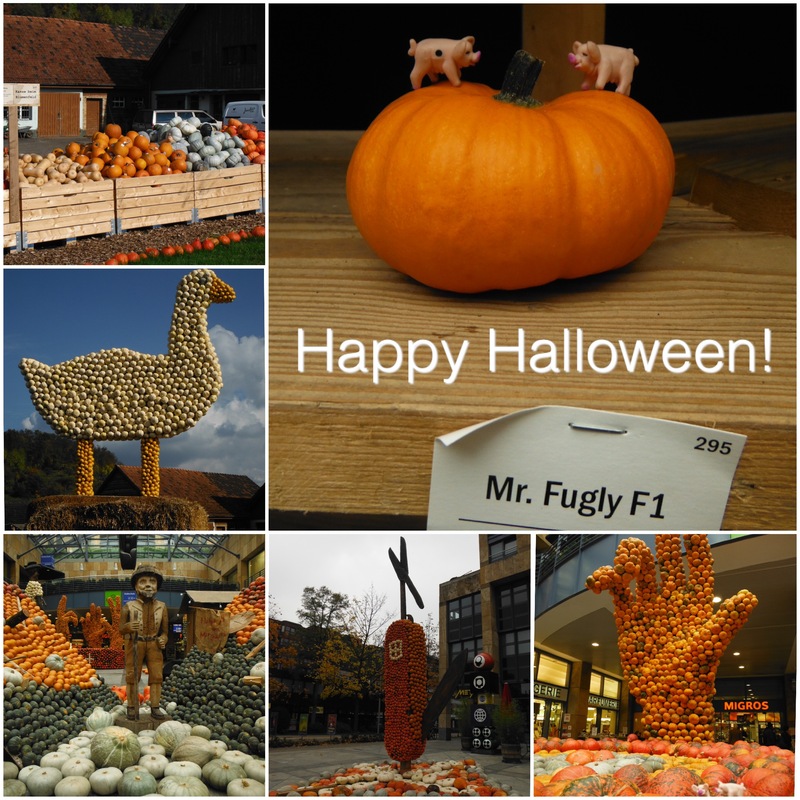 There were more pumpkins than could ever fit in a camera view, including hundreds labelled with varyingly inappropriate names. The other awesome thing about this shopping centre was that in the supermarket a man was giving out free doughnuts. It’s like Zug knew we we were coming and needed food and entertainment. After a rest (eating, washing, reminding our legs how to walk, shopping for warmer coats, gloves and socks) day in Wissembourg we decided to stay longer in France, enjoying understanding a little more of what people were saying than over the border in Germany. 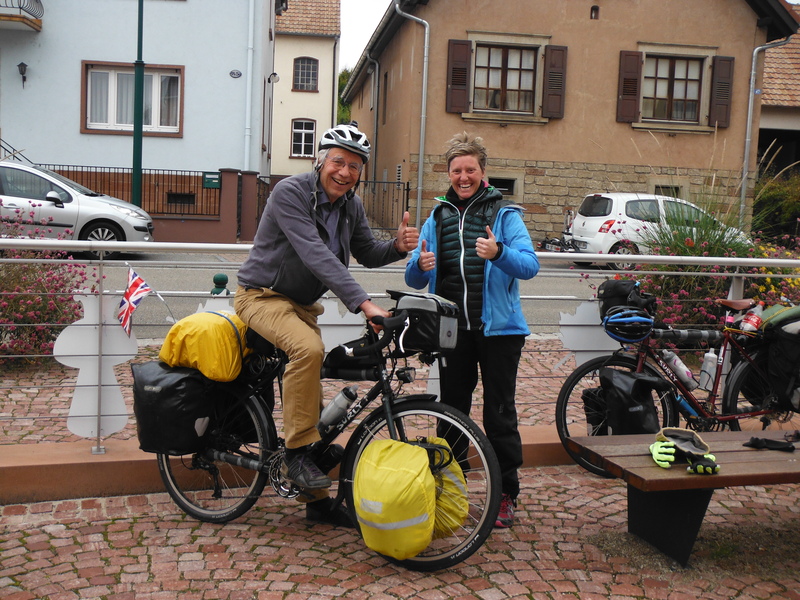 So we turned our bikes south towards Strasbourg. Unfortunately the cold snap (or what some people call Autumn) that started with frost on the inside of the tent a couple of days previously continued, and we were in for a few days of daytime temperatures of 6-9 degrees. 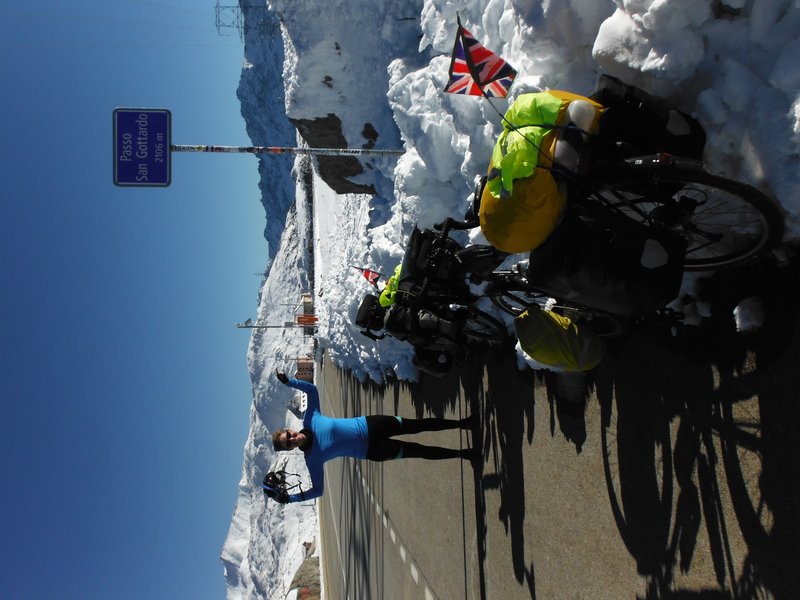 This was not what we were riding away from a British winter for. 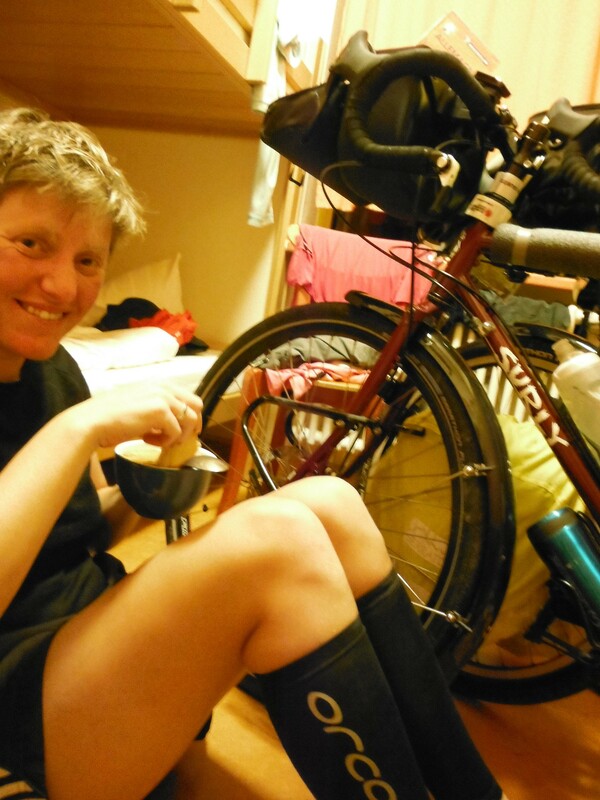 Food stops became shorter, unless they were inside in the warm where they became much longer. 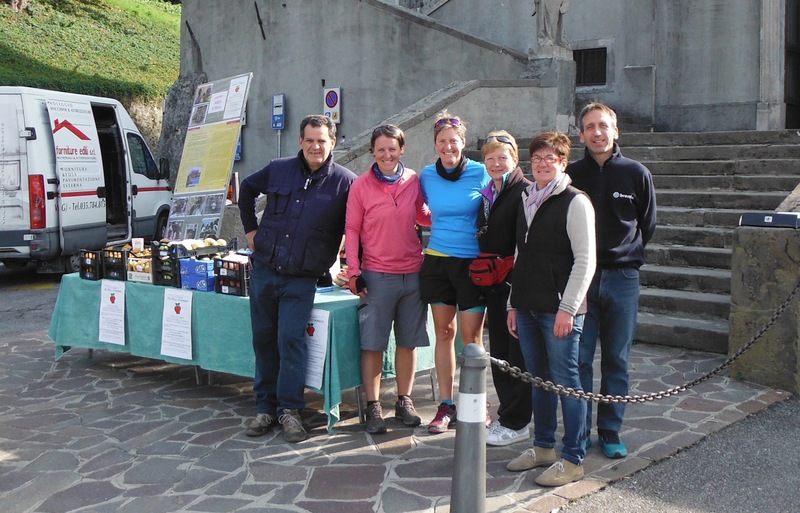 The small French town of Uberach, our short outside lunch stop for the day, was notable for two reasons. Neither of which were the brewery where we planned to have a beer but were perhaps rightly turned away for wanting to eat our sandwiches inside at the same time. 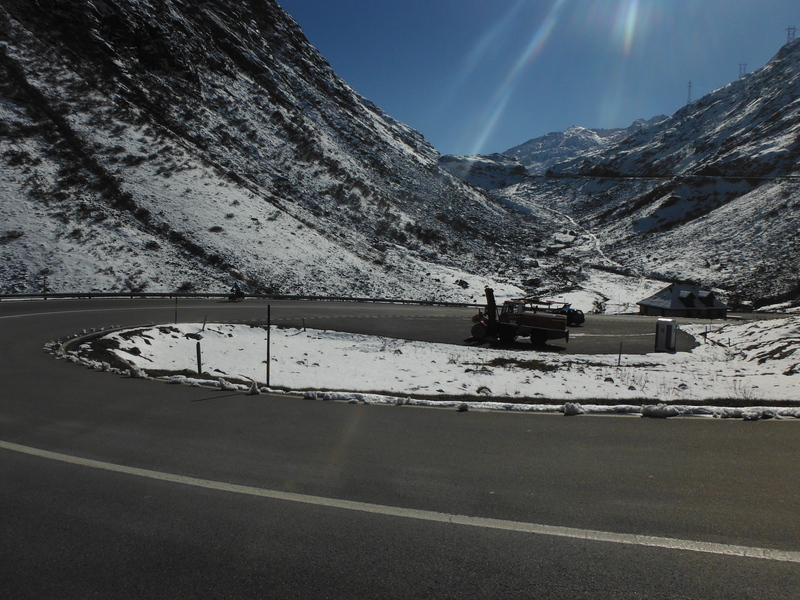 For the first time in two weeks riding on the continent we rode for a period of time on the left side of the road. Debs went first and I followed, not thinking anything of it, until about 20 meters later she stopped abruptly and started shouting sorry to an oncoming driver. The elderly lady seemed a little surprised but hopefully the British flags on the bikes explained a thing or two. Back on the right side of the road we stopped, put several layers of clothing on and ate our sandwiches in a small square outside the town hall. At some point a French guy came and chatted to us, in French, about our trip. Satisfied with the answers from two cold English girls he returned to work in the town hall, only to reappear with a colleague and a camera a short while later. Much hilarity ensued as he tried (and failed) to pick my bike up and then rode it around the small square almost toppling over. I hope we made the Uberach news. We reached Strasbourg the following day, an impressive city centre encircled by water which we liked very much given our love of islands. 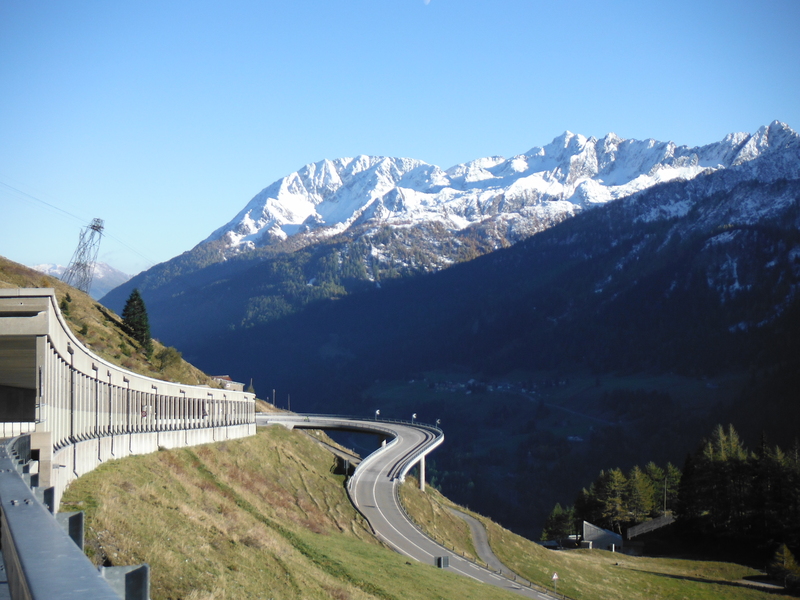 From there we had the choice of riding down the Rhine south and then east – flat – or taking a ‘short cut’ across the Black Forest in Germany – hilly. Stubborn as we are, we chose the latter due to already having ridden a good section of the Rhine in 2012. And liking a challenge. 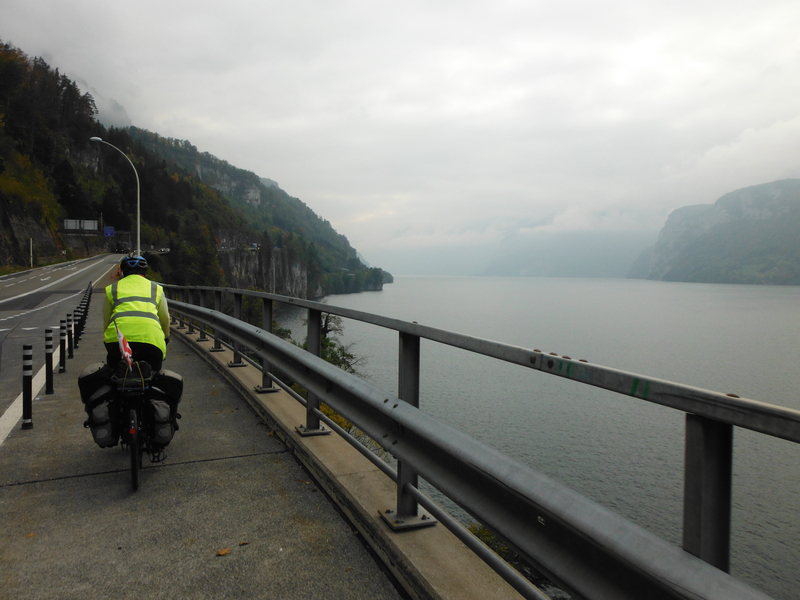 However the challenge on a cold day with a long ride mostly steep uphill to our hosts was too much for us, and after the fog closed in and the rain made everything very unpleasant we gratefully accepted a lift the last 20km. 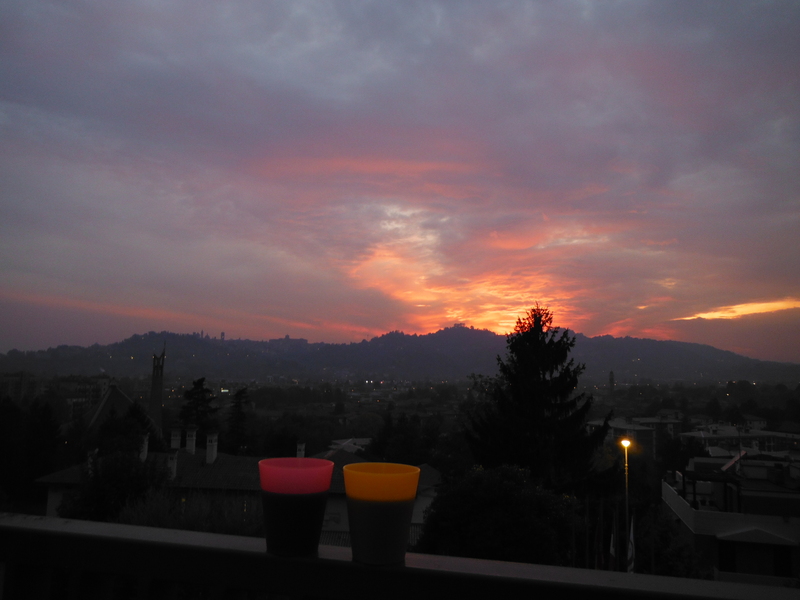 Cold, wet and a bit miserable, we were warmed up by tea, chocolate, wine and a huge dinner. 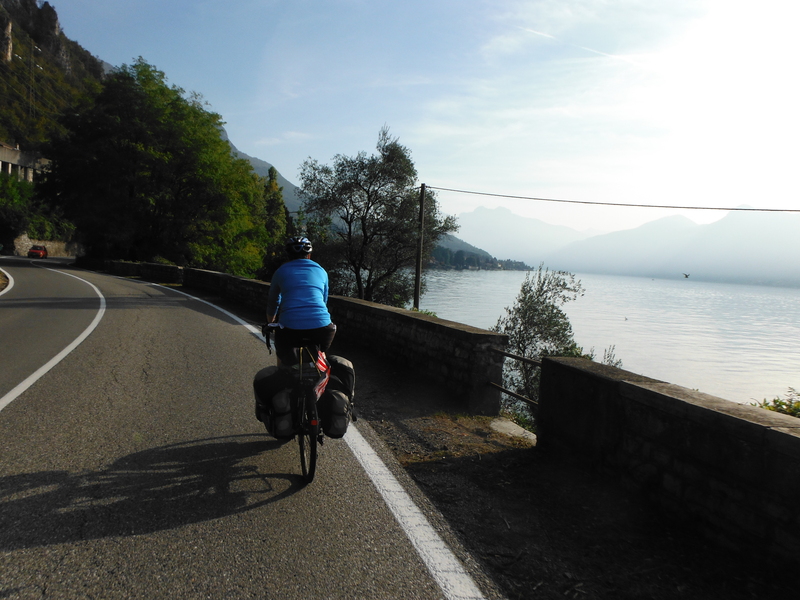 Conversations about our route and the tough weather, and the discovery that it was 25 degrees in Lake Como, led us to change plans slightly and head straight south through Switzerland – with a 2100m pass in the way – to northern Italy. Sunshine here we come?! Thanks in this post to Claud and colleagues at the Uberach Mairie; Martine, Dominique and Stefan (great guitar playing); Tobi; Dirk and Karo. 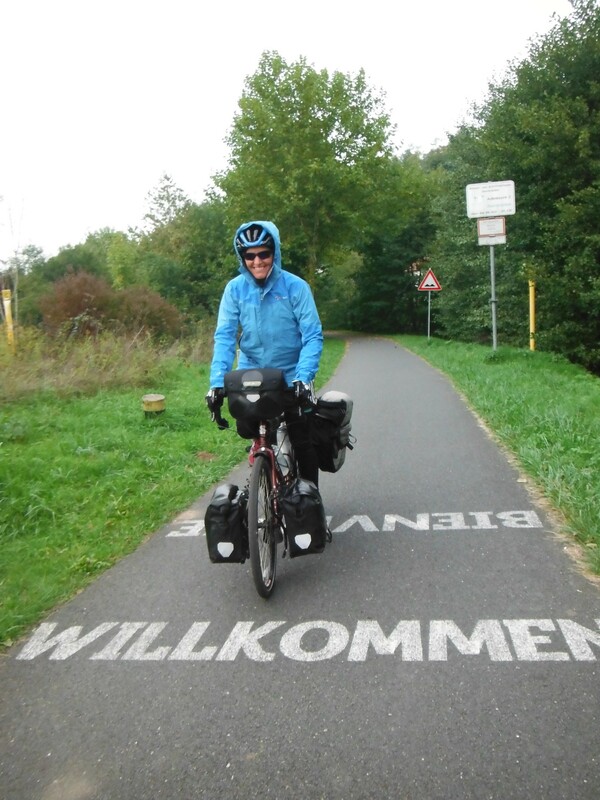 From Luxembourg we rode East into Germany – country number five – following the Moselle River to Trier. 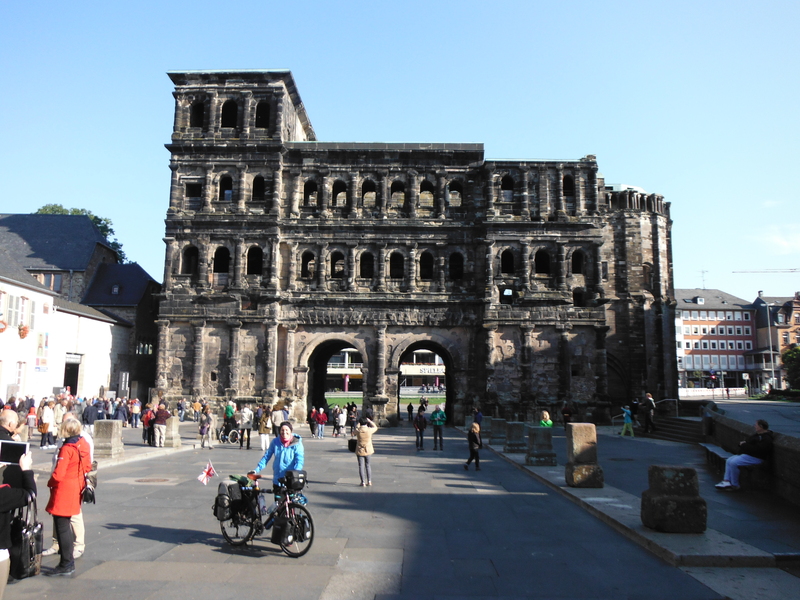 On Sunday morning we expected the city to be quiet but the area around the Porta Nigra, a big old Roman building/gateway was busy with American tourists from river cruises who were very excited by our British flags. After a picnic at the Amphitheatre grounds we turned back along the Moselle but this time branched South beside the Saar. The river wound past several picturesque towns and the sun even stayed out long enough for us to relax with some apple cake. Good job we had fuelled up on cake as a late hostel arrival (and a logic puzzle to fit the bikes in the room) meant that dinner was a little light for the day’s ride. Boiling water in a tea cup from the coffee machine with some cous cous added does not fill a hungry cyclist. Squeezed bikes in, ate cous cous. 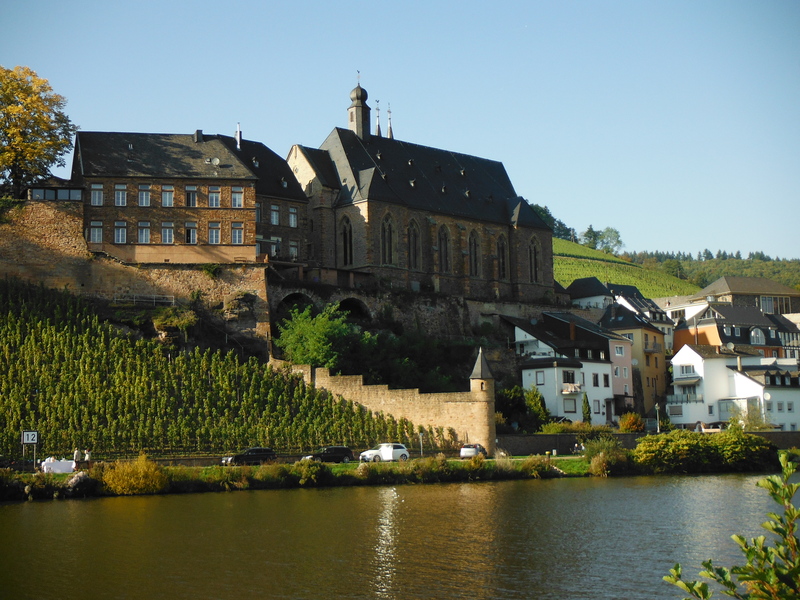 The Saar did not remain so pretty, the next day we mainly rode past towns, roads and factories of varying sizes. The most interesting was very old and had kind of been reclaimed by the plants. Maybe this is to provide inspiration for future bake off contestants (Tamal, The Final, which we watched in the tent in Luxembourg). 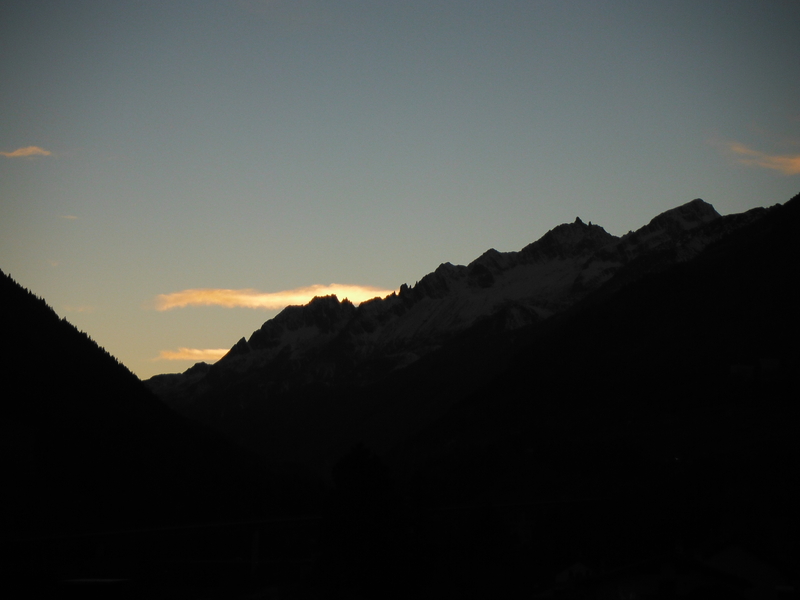 We entered France (6) in the early evening and camped in a French man’s garden. For garden read large field backing onto bike path. 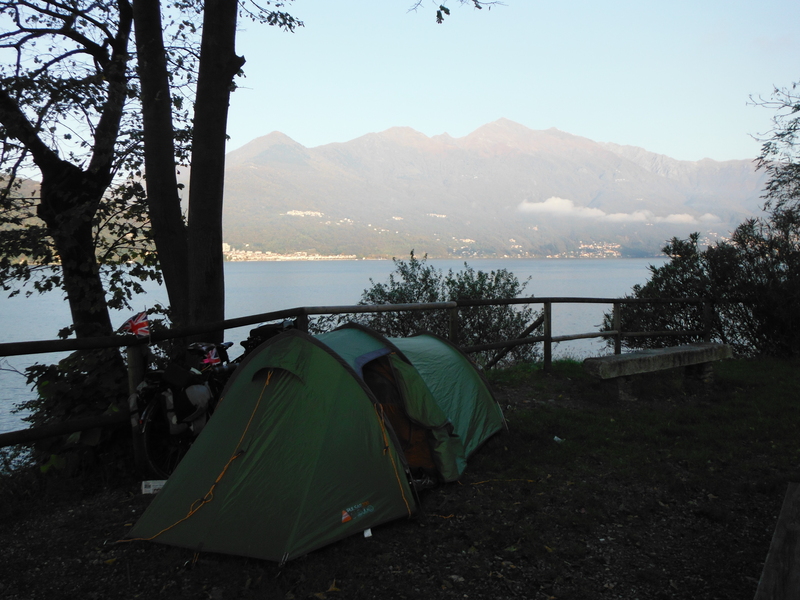 We slept well but it was very cold trying to get packed up in the morning – there was frost on the inside and outside of the tent. We learned that late breakfasts are a bad idea in the cold – sunshine and food needed to warm up. We wondered if frost in the tent put us in some kind of elite explorer crew, but eventually decided that at best we were bronze members. For silver, your water bottles have to freeze, and for gold at least one of you has to have frost in their beard. 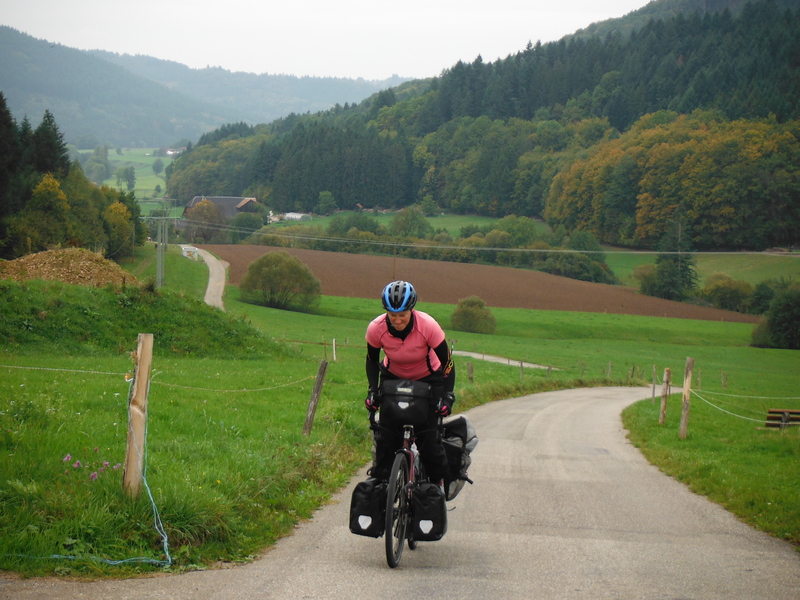 Although our next destination was in France, we spent almost the whole day riding in Germany through hilly forests and farm land. 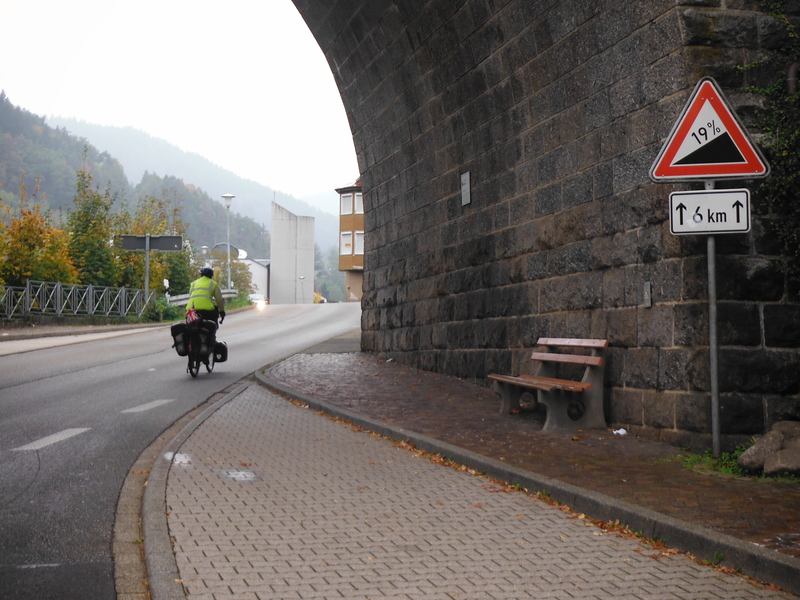 It was over 100km from Sarreguemines to Wissembourg, mainly on quiet routes and excellent cycle paths. Wissembourg is a pretty city with many old buildings and city walls. Historically the inhabitants had an unfortunate local nickname. Based on their outside-the-ramparts toilet habits they were referred to as ‘City wall shitters.’ Guess it makes sense not to go inside your lovely city. Thanks for this part of the trip to: Dominique, Eric, Coralie, enthusiastic Amercian cruisers, the man with the large garden near Sarreguimines, people who stopped us going the wrong way in German.